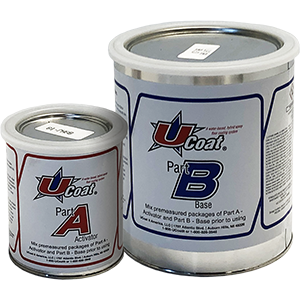 UCoat is a modified, two component, high performance water based epoxy. One of the many features of UCoat is since it is water based, there is virtually odor free, nonflammable and easy to apply. 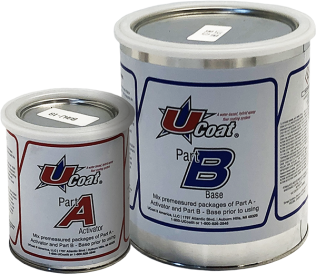 When used as a primer UCoat is applied to a wet-damp surface allowing UCoat to flow and penetrate the substrate. UCoat can be used as a standalone coating or top coated with any of UCoat It’s floor coating products. If applying UFlek decorative flakes over UCoat, a minimum of two coats maybe required depending on porosity of the substrate and color. Typical Coverage 400-576 sq. ft. Kit includes two (2) coats of UCoat epoxy (choice of color), UTex anti-slip, applicator tools, mixing pail and instructions. Add $149.95 for Safety Colors. Typical Coverage 400-576 sq. ft. Includes UCoat epoxy coating materials and UTex only. Add $149.95 for Safety Colors. Typical Coverage 200-288 sq. ft. Includes UCoat epoxy coating materials and UTex only. Add $65 for Safety Colors.